Handpicking eggs continues. 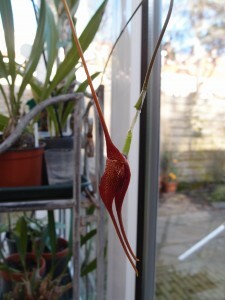 Meanwhile some orchids in the kitchen start flowering! In the not so far distance, you can see three lemons on a small tree in the garden. I’ve already bagged A. luteoflammulatus “La Paloma” eggs, A. bellotti “Sol”, A. wolterstorffi “El Bagre” and others, all over two years old. Few eggs were ready to hatch, let’s see if they resume development. This entry was posted in Chitchat, Incubation, Maintenance by tvdooren. Bookmark the permalink. The same plant has produced another flower now. Spring didn’t arrive yet…it’s snowing. I’m handpicking A. periodicus eggs now.